Truth be told, I have not been a very good tourist since arriving in Dubai. But let’s be honest – only mad people and labourers actually walk anywhere in this place, or go sightseeing in this heat. It’s 35’C by 10 am, and much hotter by mid-afternoon, so people hide inside. Since we currently do not have a car, the only sane way to get around is by taxi and metro, so walking around for hours and gazing at the various attractions is out of the question. 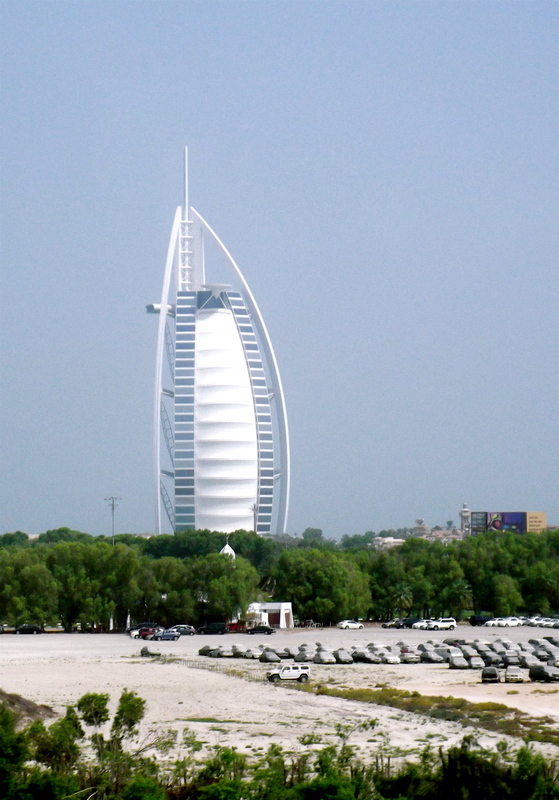 There is, however, one famous building that I seem to pass every single day, and I’m always amazed by how pretty it is — the Burj Al Arab. I snapped this picture of the icon of the Emirates while zooming along in the lovely Dubai Metro. It got me thinking that all world class cities have defining buildings — in Hong Kong it’s the Bank of China, in Tokyo it’s the ‘Golden Turd’, in New York it’s the Empire State Building. But what’s nice about the Burj Al Arab is that it rises out of nothing — no mountains, no surrounding skyscrapers vying for attention. It just stands there in all its seven-star grandness on the waterfront. And it’s shiny white exterior is a nice contrast from the desert sand. Note the luxury cars abandoned in the desert and covered in dust and sand! Hehe glad you’re liking my home town! And wish you a wonderful stay here!